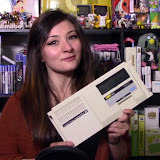 Lordy have we got a lot of retro-geekin' news for you on this lovely Tuesday! Today's Retro Round-Up includes Amiga computers, acquitted murderers, new Star Wars and old Star Trek, what more could you ask for? Check out the links below before you get any older, gramps. Dissed by Abrams but still loved by Disney, our favorite space-scoundrel-turned-malt-liquor-pimp strikes back! The classic Harlan Ellison-penned original series Star Trek episode gets its own graphic novel this week. Got some old Amiga software? Got a PowerPC computer you're not using? Well then, you're probably the only person you know who'll enjoy this. Relive the excitement of television's first combination live celebrity car chase and Ford Bronco commercial!